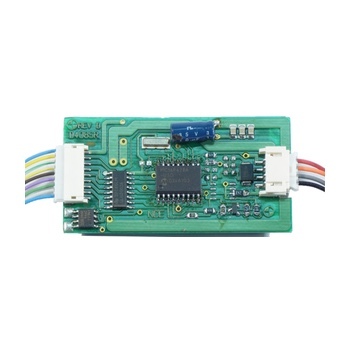 This Northcoast large scale DC decoder is bullet proof and loaded with features. Measuring 1.2″ X 2.3″ X .375″ it will fit in most large scale DC locomotives. This decoder is the new high frequency “Silent Running” pulse code modulation (PCM) type. Features: 4 Amp RMS/10 Amp peek, all function outputs can be remapped, excellent interface for Soundtraxx Decoders, and the list goes on. Current (RMS): 4 Amp Current (Peek): 10 Amps Function Outputs: 7 @ 500 u Amp.